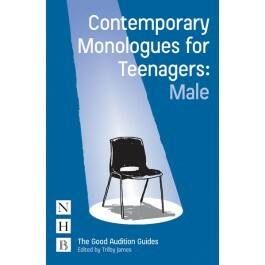 Forty fantastic male speeches for teenagers, all written since the year 2000, by some of the most exciting and acclaimed writers working today. Whether you're applying for drama school, taking an exam, or auditioning for a professional role, it's likely you'll be required to perform one or more monologues, including a piece from a contemporary play. It's vital to come up with something fresh that's suited both to you – in order to allow you to express who you are as a performer – and to the specific purposes of the audition. In this invaluable collection you'll find forty speeches by leading contemporary playwrights including Annie Baker, Jez Butterworth, Nadia Fall, Ella Hickson, Arinzé Kene, Dawn King, Jessica Swale, Jack Thorne, Enda Walsh and Tom Wells, from plays that were premiered at many of the UK's most famous and respected venues, including the National Theatre, Shakespeare's Globe, Manchester Royal Exchange, Royal Court Theatre, Bush Theatre, Traverse Theatre, the Young Vic, and the Edinburgh Festival Fringe. Drawing on her experience as an actor, director and teacher at several leading drama schools, Trilby James introduces each speech with a user-friendly, bullet-point list of ten things you need to know about the character, and then five ideas to help you perform the monologue. This book also features a step-by-step guide to the process of selecting and preparing your speech, and approaching the audition itself.